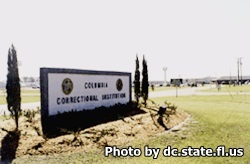 Columbia Correctional Institution is located in Lake City Florida. It is a level V facility that houses approximately 1,430 male adult inmates of the following custody levels: Minimum, medium, and closed custody. Inmates who are incarcerated here can take academic courses for adult basic education, earn their GED, and participate in a volunteer literacy program. This facility currently offers no PRIDE assignments or community work detail. Although this institution does not offer any substance abuse treatment programs, it does allow inmates to take part in Alcoholics Anonymous meetings, as well as a program called the Fresh Start smoking cessation. Religious services including religion education courses are offered. Anyone wishing to visit an inmate may do so once they have filled out a visitors application and it has been approved. This is a process that can take up to thirty days to complete. Visiting hours are Saturdays and Sundays from 9am-3pm. Visitors can start arriving at the institution no earlier than 7:30am, and no later than 2pm. Registration for visiting beins at 8:15am.